The regeneration of critical urban areas through the redesign of public space with the intense involvement of local communities seems to be the central focus of place-making according to some widespread practices in academic and professional circles. Recently, new expertise maintains that place-making could be an innovative and potentially autonomous field, competing with more traditional disciplines like urban planning, urban design, architecture and others. 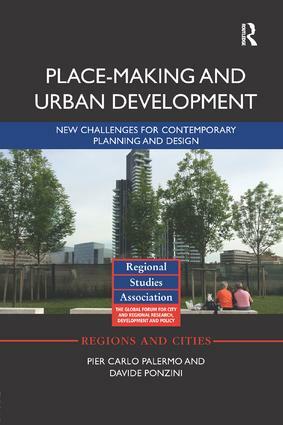 This book affirms that the question of 'making better places for people' should be understood in a broader sense, as a symptom of the non-contingent limitations of the urban and spatial disciplines. It maintains that research should not be oriented only towards new technical or merely formal solutions but rather towards the profound rethinking of disciplinary paradigms. In the fields of urban planning, urban design and policy-making, the challenge of place-making provides scholars and practitioners a great opportunity for a much-needed critical review. Only the substantial reappraisal of long-standing (technical, cultural, institutional and social) premises and perspectives can truly improve place-making practices. The pressing need for place-making implies trespassing undue disciplinary boundaries and experimenting a place-based approach that can innovate and integrate planning regulations, strategic spatial visioning and urban development projects. Moreover, the place-making challenge compels urban experts and policy-makers to critically reflect upon the physical and social contexts of their interventions. In this sense, facing place-making today is a way to renew the civic and social role of urban planning and urban design. Pier Carlo Palermo is Full Professor of Urban Planning at Politecnico di Milano, Italy. Davide Ponzini is Assistant Professor of Urban Planning (Ricercatore) at Politecnico di Milano, Italy.